This painting was a finalist in the 1935 Archibald Prize. Signed l.r.corner, brown oil "MURCH". Not dated. Longstaff. Wynne Prize to Muir Auld', The Sydney Morning Herald , 'Archibald Prize: Won, pg. 14, Sydney, 18 Jan 1936, 14. Reference to portraits painted by Arthur Murch. Liz Gibson, Parallel visions: works from the Australian collection , 'Rayner Hoff / Arthur Murch', pg. 60-71, Sydney, 2002, 66 (colour illus. ), 145, 147. Steven Miller, Dogs in Australian art , 'Black and tan terrier (miniature)', pg. 50-51, Kent Town, 2012, 50, 51 (colour illus.). Arthur Murch: An artist's life 1902-1989 , Avalon Beach, 1997, 43, 53, 76 (colour illus.). National Art Gallery of New South Wales, The Archibald Prize 1935: list of entries , Sydney, 1935, 3. Art in Australia [series 3, no. 61] , Sydney, Nov 1935, 25 (illus.). 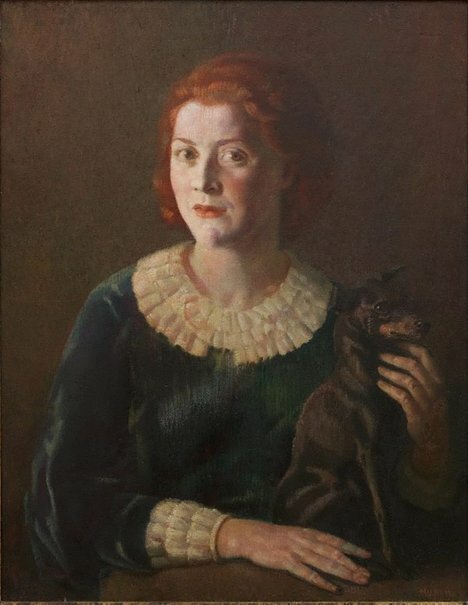 titled 'Portrait of Miss Suzanne Crookston'; This picture was awarded the Society of Artists' Award, 1935. The Art of William Dobell , Sydney, 1946, 47 (illus. ).